Phoenix Family Foodie Blog: Cheat Day! Valentine's Day: Straw-Berried Treasure! Cheat Day! Valentine's Day: Straw-Berried Treasure! Well, if you're going to cheat on your diet for Valentine's Day, you might as well do it in a romantic way! What's more romantic than a chocolate lava cake on Valentine's Day? 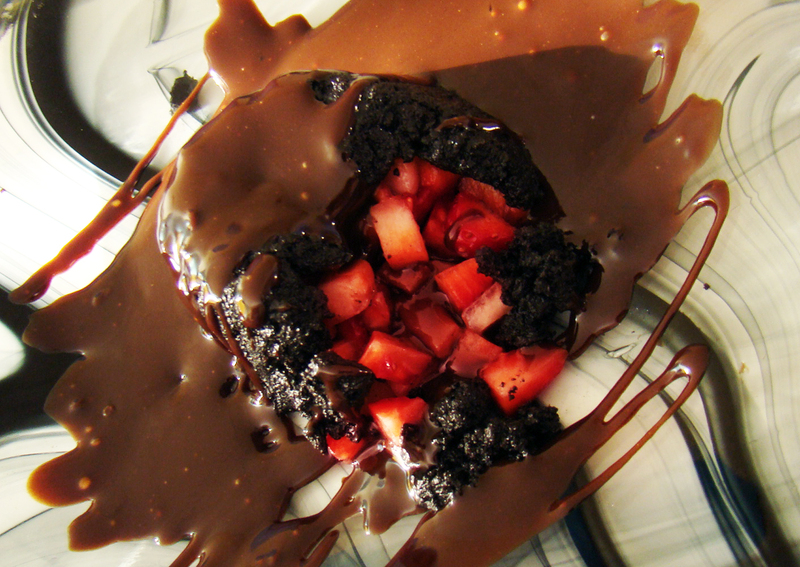 An Oreo-crusted STRAWBERRY lava cake with chocolate ganache topping! This dessert is easy to make and lights up your tastebuds for more, more more! It's a smaller portion, so as long as you stick to one, you can't do too much damage! Enjoy! Place the Oreos in a plastic bag and crush them finely with a rolling pin or kitchen mallet. Add them to a large mixing bowl and stir in the butter until combined. Spray two cupcake tins with cooking spray. Cut two 1x6 inch strips of parchment paper and fold them to fit into the bottom of the cupcake tins with the edges hanging over like handles. This will help you remove the cakes when ready. Spoon the Oreo mixture into the cupcake tins until they're about 1/2 full. Using your fingers, shape the cookie mixture around the edges of the tin to form a hollow cup. Refrigerate for about 10-15 minutes, until the butter sets slightly. For the ganache, combine heavy cream, chocolate chips and Nutella in a small saucepan. Stir on low heat until a thick, smooth, creamy ganache forms, about 10 minutes. Remove the cakes from the refrigerator. Fill the cups with the chopped strawberries. Carefully lift the parchment paper handles to loosen the cakes (run a butter knife around the edges if necessary). Place a serving plate upside down on top of the cupcake tin. Flip the cupcake tin over so that the cakes are face down on the plate. Remove the cupcake tin, spoon the warm ganache liberally over the cakes and serve immediately.